LAST FINAL GAME DETROIT TIGER STADIUM FINAL LAST GAME photo picture art print for sale. 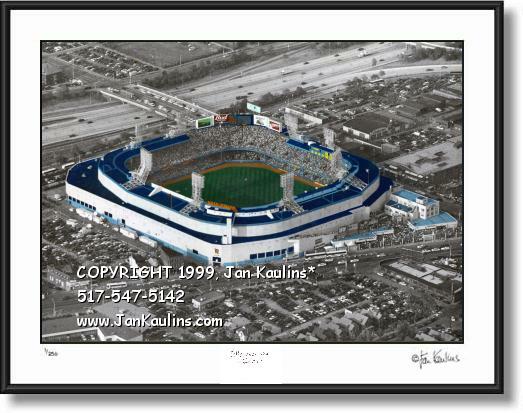 DETROIT TIGER STADIUM LAST FINAL GAME aerial picture print photo art for sale. Better than the last pitch at Tiger Stadium photo print. This is an original aerial Hand-Colored THE LAST FINAL GAME Detroit Tiger Stadium Sept. 27, 1999 picture photo art photography print - Old Detroit Tiger Stadium Last Final Game aerial photo poster picture in DETROIT, MICHIGAN -Last Final Game at Detroit Tiger Stadium aerial picture photo photograph - Final Last Game Old Detroit Tiger Stadium photo picture photography art prints for sale: This historic Detroit aerial photo, a picture of old Detroit Tiger Stadium photo, is made from an original HAND-COLORED BLACK AND WHITE PHOTO by nationally recognized artist/photographer Jan Kaulins. This Detroit Photo Gallery photo of old Detroit Tiger Stadium is an exceptional Detroit Tiger Stadium aerial picture photo of the final last game ever played at historic old Detroit Tiger Stadium on September 27, 1999. (THE DETROIT TIGER STADIUM PHOTO ART GALLERY AND DETROIT TIGERS STADIUM ART PHOTOGRAPHY GALLERY) Please note: The signed and numbered Limited Edition 'The Last Game' 11x14 photo has been sold out, but, due to popular demand is being offered in small un-numbered ARTIST PROOF edition of 100 pieces total. The only difference will be that instead of the edition number in bottom left corner beneath photo, it will read A/P for the artists proof series. Everything else is the same. Some collectors often prefer an Artist Proof edition as it is usually much smaller than the original larger edition.